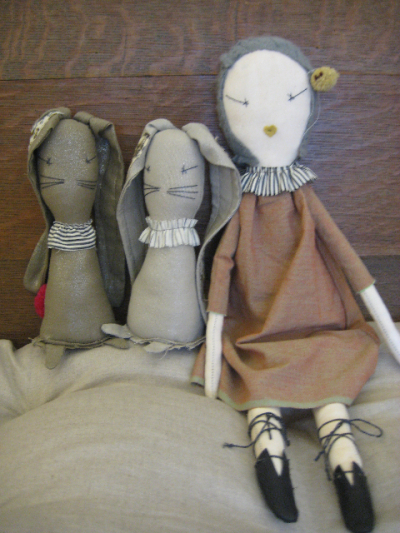 Jess Brown makes the sweetest, old-fashioned rag dolls. If I ever have a baby girl, you know I'll be getting her one of these sweet little gals! I have loved the work of Jess Brown and was delighted to find out that she lives in nearby Petaluma! And, as if that weren't fun enough, I found out that she (and her friend Stacy) have an adorable little store called Maude. Here are a few photos of Jess Brown's work. I love the quilt/baby blanket I made, but Jess's quilt is amazing! Click here for the rabbit/doll. Jess- we hope to visit your shop SUPER soon! !